Mouton Rothschild was upgraded to First Growth status in 1973, placing it amongst the illustrious company of Ch. Lafite-Rothschild, Ch. Latour, Ch. Margaux and Ch. Haut-Brion. The highly successful vintage of 2000 is given further prominence thanks to its millennium status. 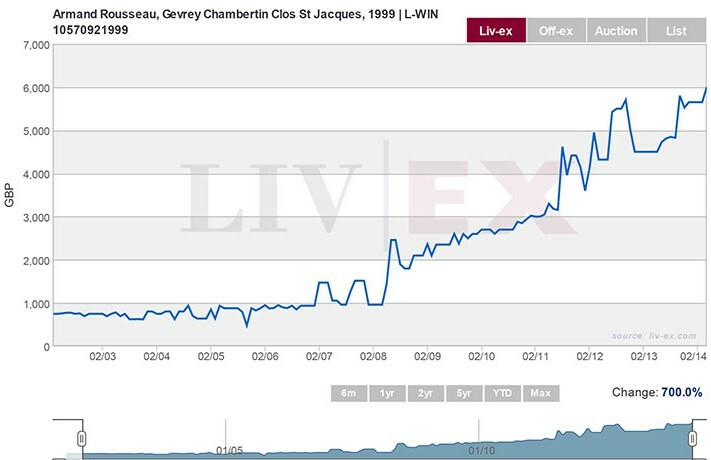 Now approaching its prime drinking window, the value has risen steadily throughout the past 10 years, following its initial release price of £2,000. The iconic bottle design (Mouton commission a different artist for each vintage) may well have lessened the impact of the various downturns within the market, not least over the past few years. In terms of drinking pleasure, the finest days of this wine are yet to come, with a remaining lifespan of many decades. It therefore remains at attractive purchase for many with a long term view. The wines of Ch. Lynch Bages are a very popular choice for both drinkers and investors at Berry Bros. & Rudd and around the world. Placed as a fifth growth in the 1855 classification, but recognised by consumers and critics as being of second growth quality. It is certainly amongst the world’s most recognisable wine brands, very well established globally with a strong secondary market. 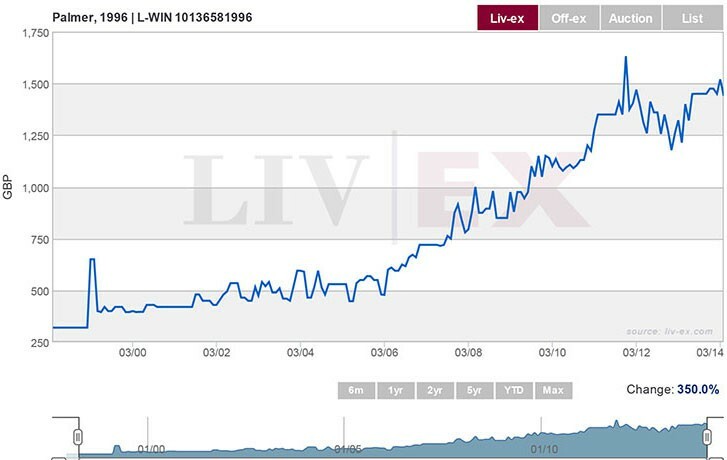 Initially released at £450 per 12 bottle case, trade has been a little volatile at times but overall on a positive trajectory towards its current value of £1700. The quality of the vintage should ensure continued demand over the coming years. An indicator of possible future performance lies in the 1990 vintage of Ch. Lynch Bages – additional age and consumption results in a restriction of supply. It is currently valued at £2,600 per 12 bottle case. Ch. Palmer is second only to the great Ch. Margaux, within the commune of Margaux. 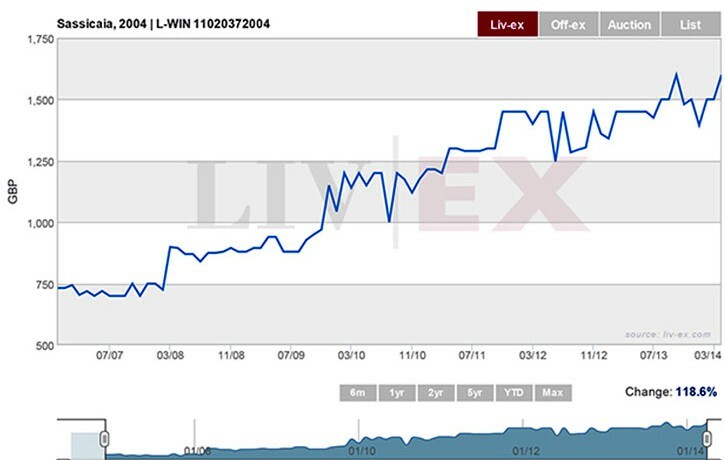 This 1996 wine saw an uplift in value inside its first 18 months of trading, owing to a very generous release price of only £324 per 12 bottle case In bond. Overall, Ch. Palmer’s excellent 1996 followed a very traditional curve up until the peak of the market in late 2011. 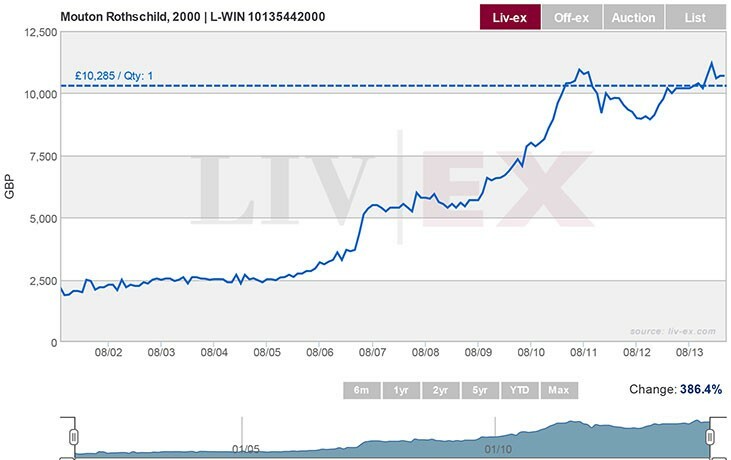 The subsequent fall in value in late 2011 is typical of the performance of the wider market during this period. With a future outlook, this case looks attractively priced within the now stable market amid a brightening economic outlook. As with many of the leading 1996 Bordeaux reds, this wine is beginning to drink very well and we therefore expect many cases to disappear from the market over the medium term. First released in 1968, Sassicaia can be credited as the first of the “Super Tuscan” wines. Global demand for the Super Tuscan wines began in the 80’s and in recent times demand has increased further following a series of exceptional vintages. 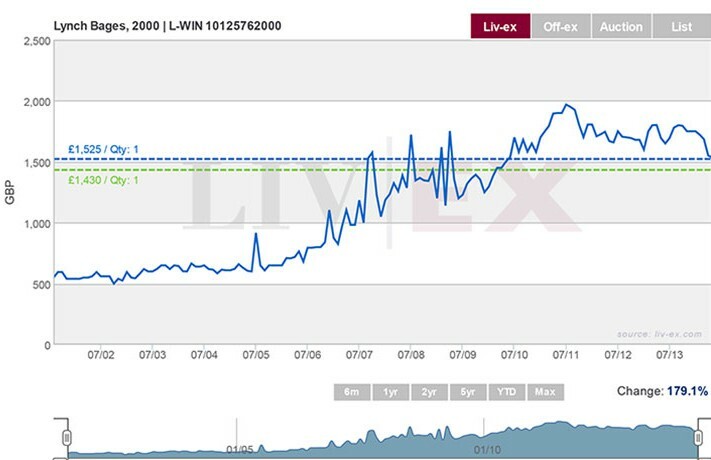 2004 is an exceptional vintage for Sassicaia and was released at £900 per 12 bottle case in bond. The strengthening secondary market for this fine Italian red is highlighted by the relatively speedy uplift in value - currently trading at £1600 per 12 bottle case in bond. It is also an example of the broadening of the fine wine market; as markets mature and develop, so do the palates and interests of its consumers. An investment portfolio can now contain a more diverse selection of wines than ever before, although such diversifications away from Bordeaux should be carefully judged. Fine Burgundy can, increasingly, be considered to be an investible wine region. Volumes produced are, however, very small (a tiny fraction of what can be produced in Bordeaux for example) and so gaining access to the finest cases can be very difficult indeed. Demand for the reds of Burgundy has increased markedly in recent times but quantities produced remain the same. The steady increase in value since 2008 is evidence of this growing demand. A further example of a broadening market. With regard to this particular Burgundy case; Armand Rousseau is one of the greatest producers in Burgundy, whilst Clos St. Jacques is the finest of the Gevrey Chambertin 1er Cru vineyards. From the exceptional 1999 vintage, this is an exceptional wine to appeal to the true connoisseur.